Last weekend I was invited to a birthday party at Strip Steakhouse at Planet Hollywood Las Vegas and it was a beautiful party. To my sweet surprise all of the tray passed appetizers were on the healthy side. The food was so beautiful it inspired me to create this recipe. Wash and dry the mushrooms. Pop out the stems and place them caps down. Stuff them by hand with goat cheese. 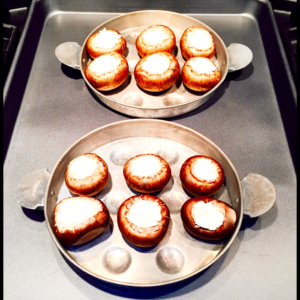 Place them in the oven preheated to 350 degrees and let them cook for 25 minutes. Drizzle the Original Balsamic Vinegar by Leonardo e Roberto’s Gourmet Blends onto your serving dish. 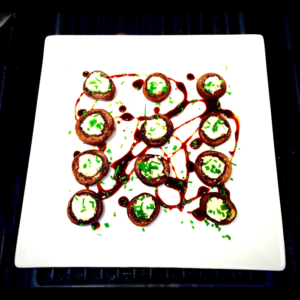 When the mushrooms are ready remove them from the oven and place them into the balsamic drizzled plate. Chop up the chives and sprinkle them over the baked mushrooms and they are ready to be served. 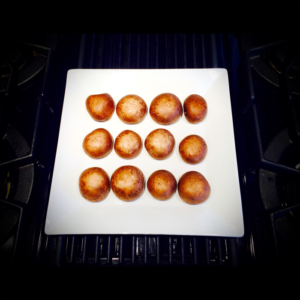 Gluten free, vegetarian, finger food, appetizer, side dish, easy to prepare.